Rediff – ‘When Ashwin is bowling, you can see he has different plans for different batsmen, and he is working them out. IMAGE: Virat Kohli celebrates scoring a century during the first Test against England. He has been part of many enthralling duels with Sachin Tendulkar and Pakistan’s spin great Saqlain Mushtaq says Virat Kohli is the only current player who ‘comes close’ to matching the standards of his legendary contemporary. England’s spin consultant Saqlain said that India’s turnaround in the five-match series would largely boil down to how Kohli leads the batting line-up. 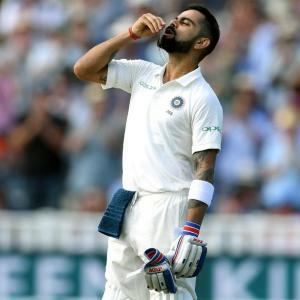 Captain Kohli led the way with a century and a 97, as India staged a comeback in the series with a victory in the third Test at Trent Bridge. Having played against many Indian sides that were pivoted on singular pace attack leaders, Mushtaq also said that he is mighty impressed by this new crop of Indian pace bowlers who have caused South African and English batsmen a lot of trouble in the last six Tests. Next articleWomen’s Super League semi-final: Western Storm v Surrey Stars – live! County cricket: Lancashire v Surrey, Somerset v Yorkshire and more – live!